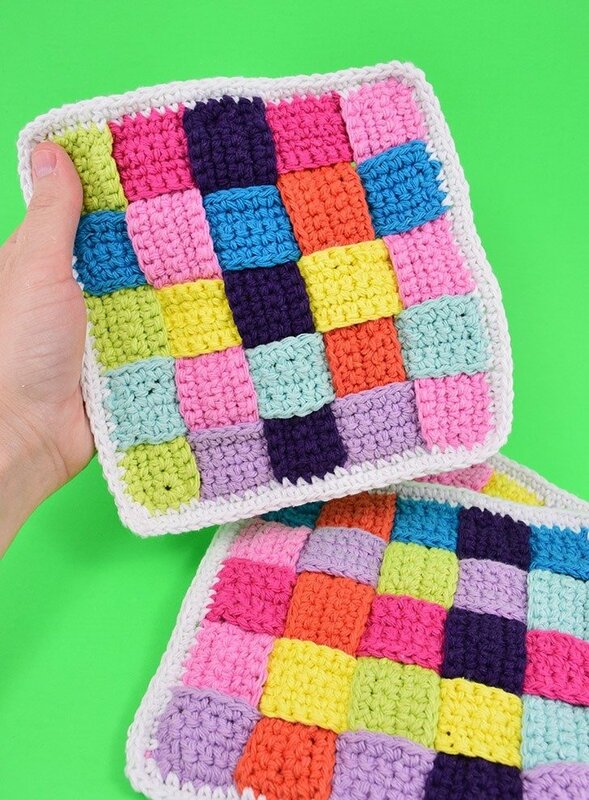 Weave together strips of single crochet to make an awesome woven crochet washcloth using cotton yarn. 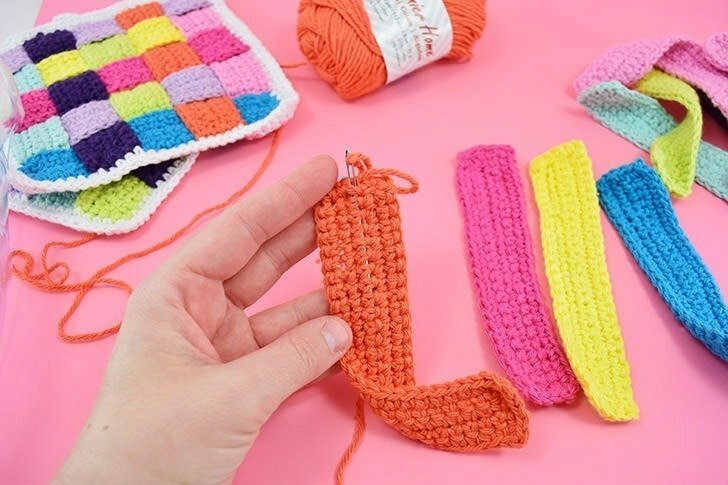 This DIY is so fun looking yet super practical! I think I’m always going to be one of those people that likes to keep her hands busy. Watching TV, just staring at it, doesn’t work for me. Riding in a car and just watching the road pass me by bores me like nothing else. And sitting in a waiting room with nothing but my thoughts for company typically induces some sort of O.C.D. panic. It probably seems rude to a lot of people that while watching a movie with the family I’m looking more at what’s going on in my hands than to the screen like everybody else. Well, unless my parents are around in which case they’re probably looking at their laptops or tablets at the same time, too. But everybody else will give me comments like “aren’t you actually going to WATCH the movie?” It can straight up make me feel rude, but, in all honesty, if I couldn’t keep my hands busy I’d get so bored I’d just want to walk off, anyway. I’ve been working on this crochet rug off and on for a while now and I keep hitting snags with it. I don’t even know how many times I’ve ripped my work out and turned it back into a ginormous ball of yarn, but on this one day as I started to tear it out I started to get really bummed out. I mean, it’s a part of the job. I make things and sometimes they pan out and sometimes they don’t. Not everything I do is going to be a winner. But I really, really wanted for this silly rug to work out and it just wasn’t. And so as my dad and I walked through Michael’s on his recent visit, me fresh off of the frustrating defeat of tearing out, quite literally, hours and hours of work and I spied this cute package of cotton yarn in colors that matched up really well, I decided to snap it up with absolutely no idea what I’d use it for. Using the amazing but only occasional 50% off coupon, I snagged the 10 colors of yarn for only $10. My dad asked me what I was going to do with it in the car and I told him that I didn’t know, I just needed something different to work on for a while. When I got home I played around with the yarn and decided that I was a big fan. I don’t recall thatI’ve ever used Premier cotton yarn before, but I really like it. It’s a bit thinner than the Sugar ‘n Cream I normally buy but the texture is pretty similar otherwise. But the fact that I was able to buy 10 with 1 discount coupon since they were packaged together was fabulous. Going through my ideas notebook I decided to start making strips to weave. 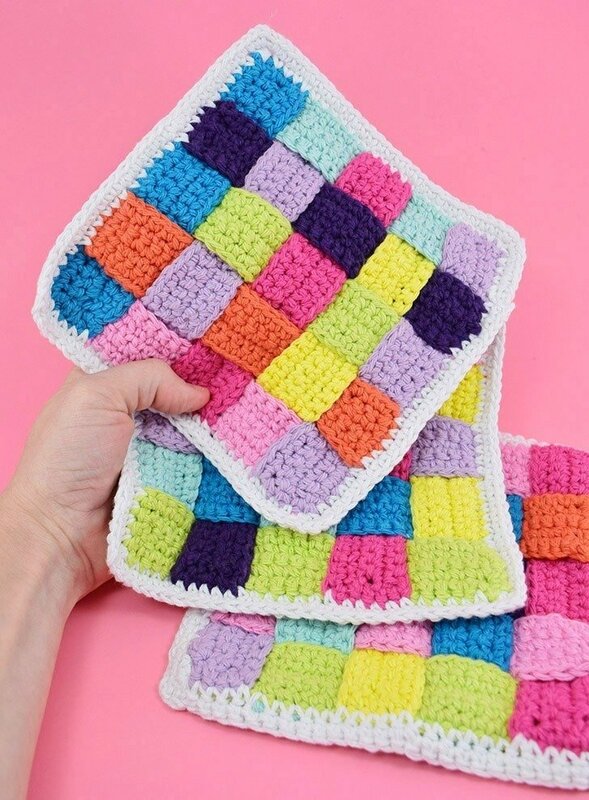 What a perfect project with all of these candy colors, right. 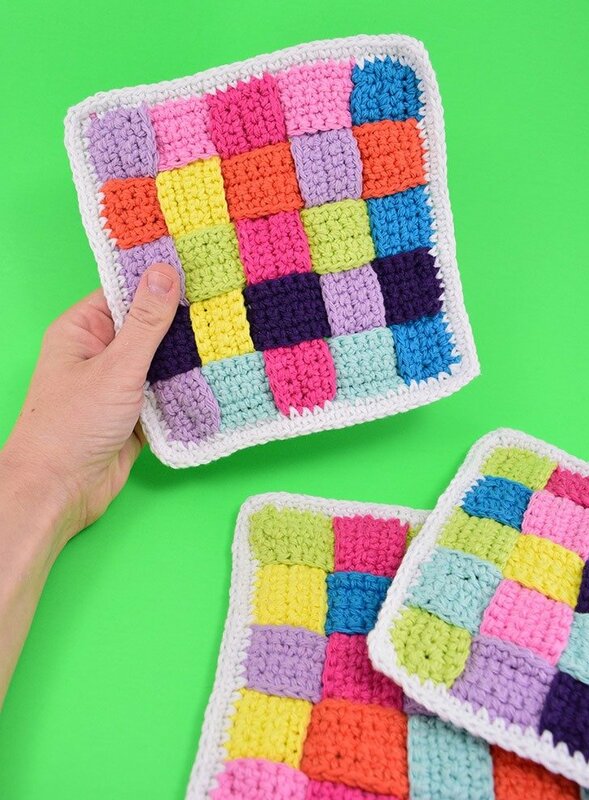 My first washcloth worked up in about 2 and a half hours with the working out the kinks and all, but my next 2 whipped up super quickly, though I worked on them sporadically so I don’t have a good time estimate for you. I can tell you that this project is one that works up so well on the go. 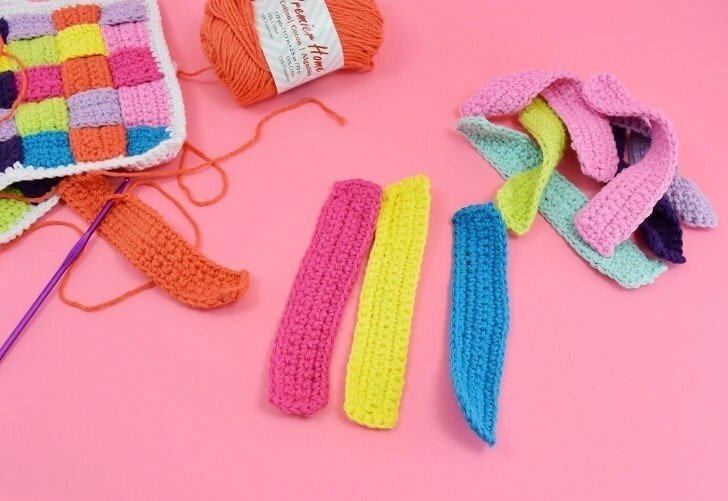 You can take a single ball of yarn, your hook a yarn needle (run through the paper label surrounding the yarn to keep from getting lost) and a pair of nippers and make strips to weave until that yarn runs out. I did this on several occasions just tossing my finished strips into my purse and it was a pretty fab thing! 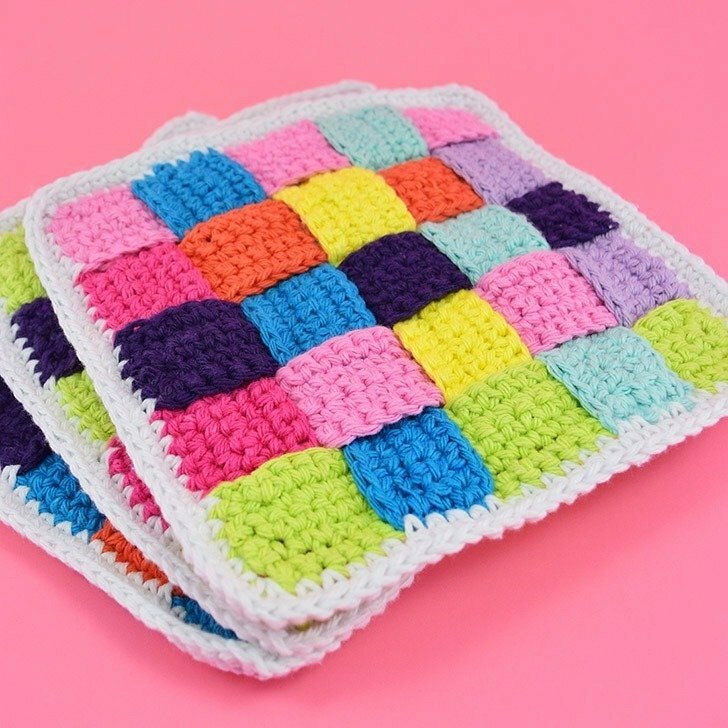 Want to crochet up a simple but spectacular looking woven crochet washcloth? 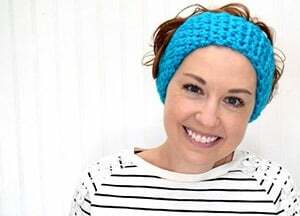 Chain 26 and single crochet down the length so that you have a foundation that is 25 stitches long. 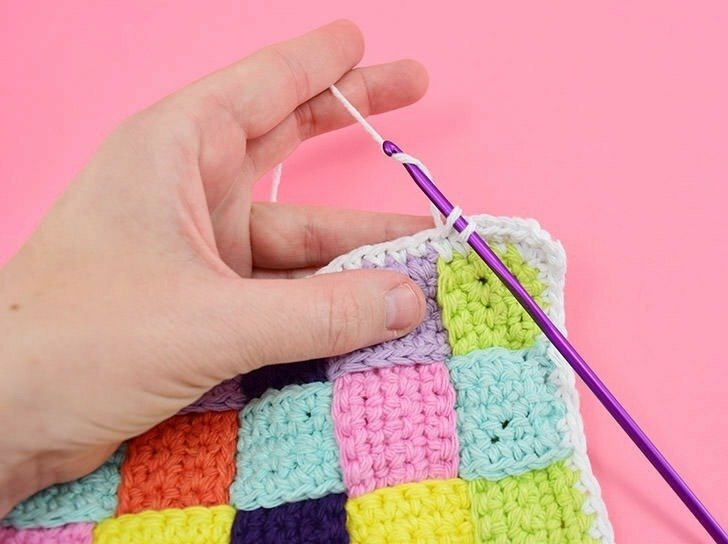 Create 3 rows of single crochet stitches (all with a count of 25 down to the end). 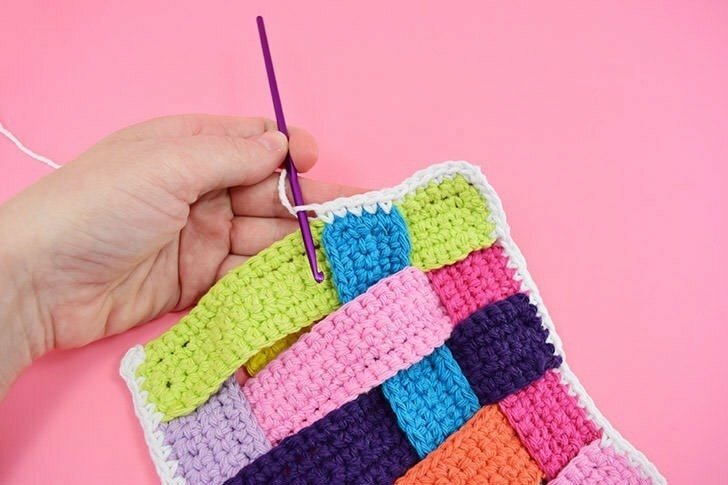 After the third row, create a single crochet border around the piece so that you have 4 all lovely looking sides. 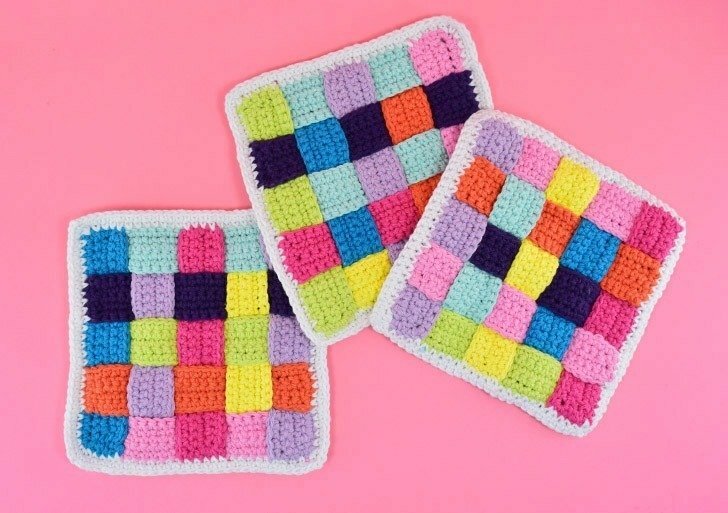 Need some help with a single crochet border? 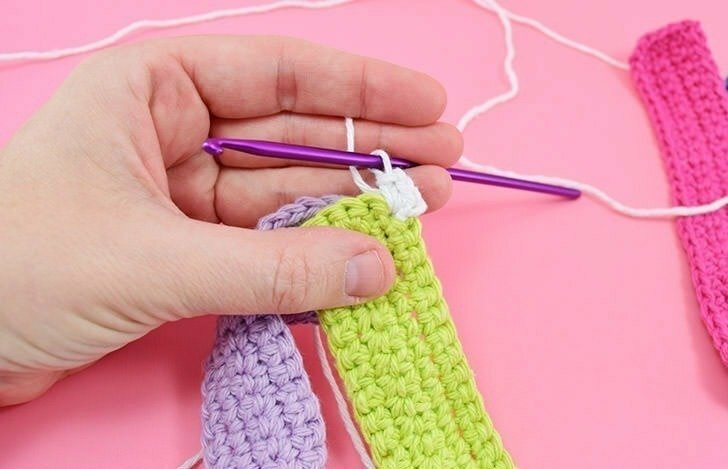 * Quick tip, when creating single crochet stitches you do NOT count the chain 1 during turns as the first stitch. You always begin stitching in the first stitch from the previous row. Once you’ve finished your crochet strip weave in the ends. 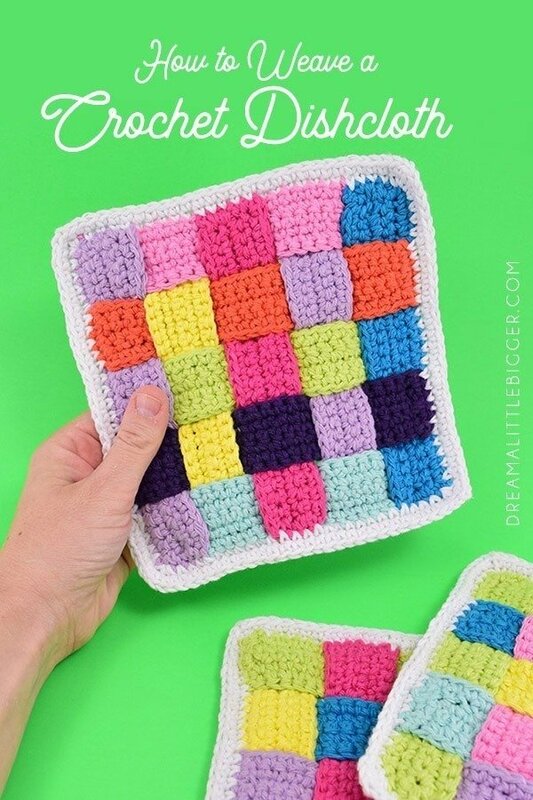 For each washcloth, you will need a total of 10 strips. 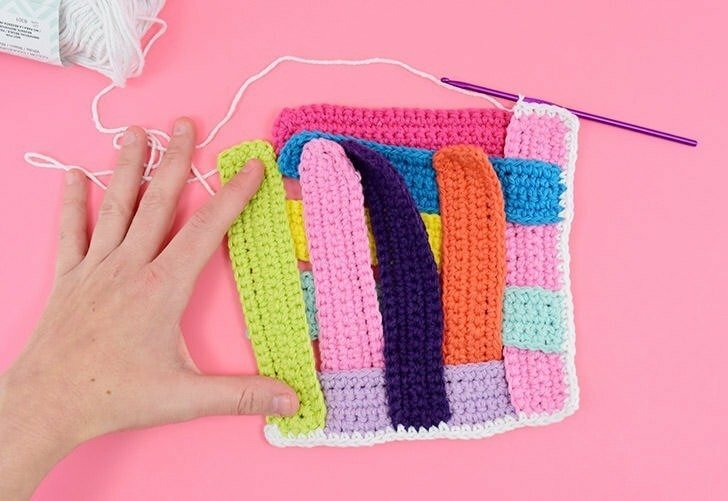 You want your strips to be nice and neat but perfection isn’t really necessary, making this a great project for practice. Weaving the strips together might seem daunting, and somehow my first attempt I really made it a total nightmare for myself and I seriously don’t even know how. Like, nothing matched up right and I put things in the wrong order and, just WOW. But don’t sweat it because we’re going to knock this puppy out of the park the first time and you’ll probably wonder exactly how I messed up so badly because it’s really pretty easy. Ready to do it right? 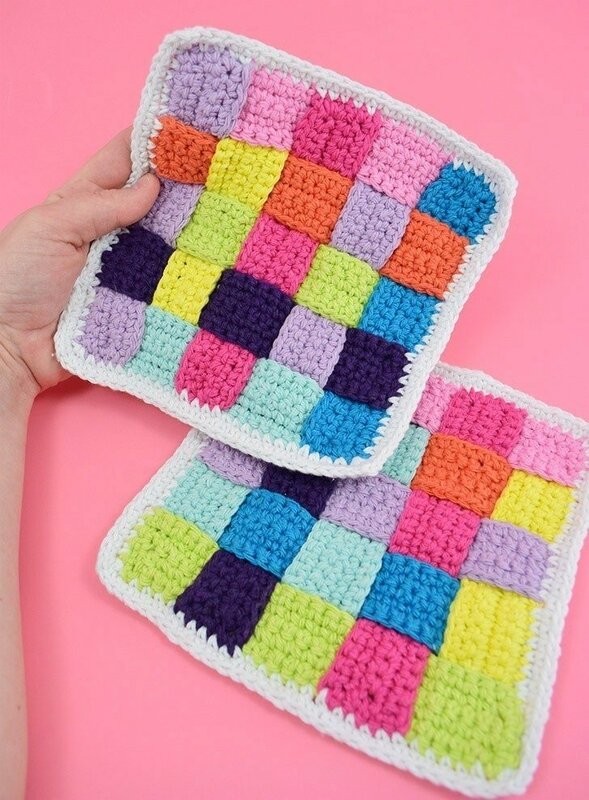 To start to take 2 strips that will form 2 sides of your washcloth. 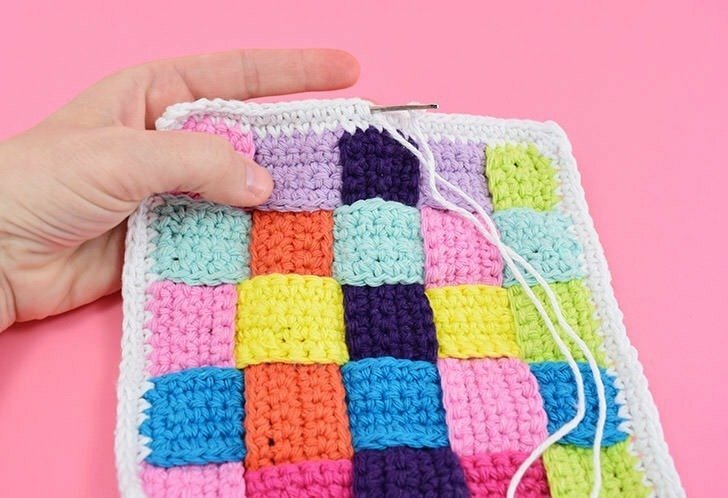 If you are concerned with the placement of your colors you can lay out the pattern first and choose your colors from there. For mine when I tried with the darker colors, like the dark purple on the edge, it was super distracting so I took mine apart and did them over with that strip closer to the center where it looked better. Chain once to attach the yarn and then single crochet in the same space. 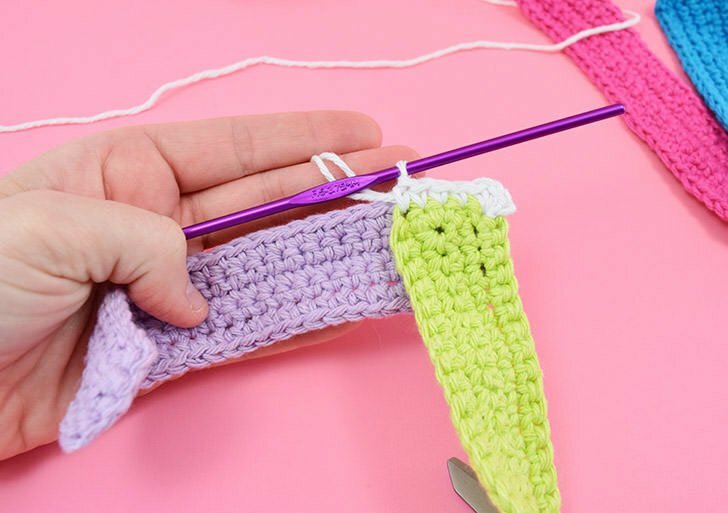 Chain once (to form your corner) and single crochet in the same space again. This is your first corner formed. 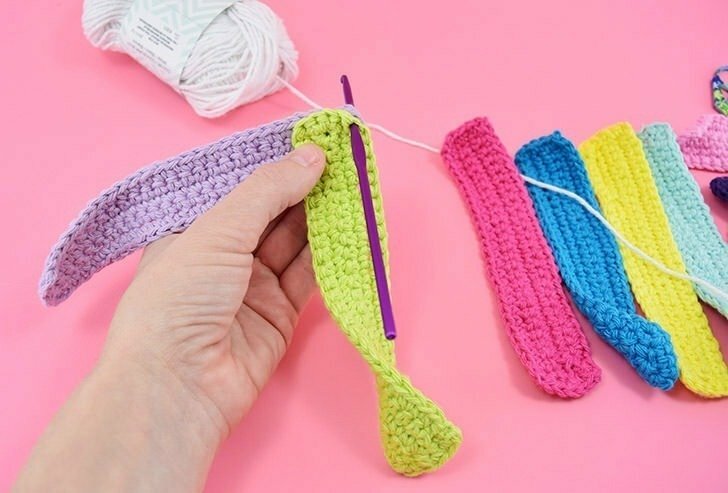 Single crochet down the line, through both loops on the stitches for both of your strips, until you reach the other corner of your vertical strip like seen above. 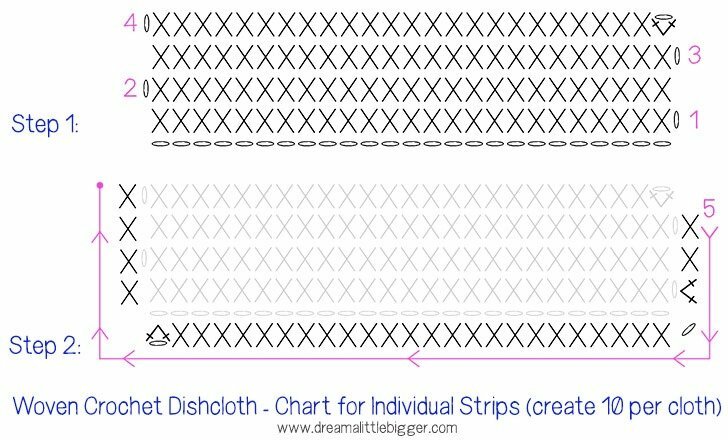 Place your next strip to the OPPOSITE side of the horizontal strip you’re working with to start the woven pattern. Match up to the corner on the new strip to the next available stitch on the horizontal one. 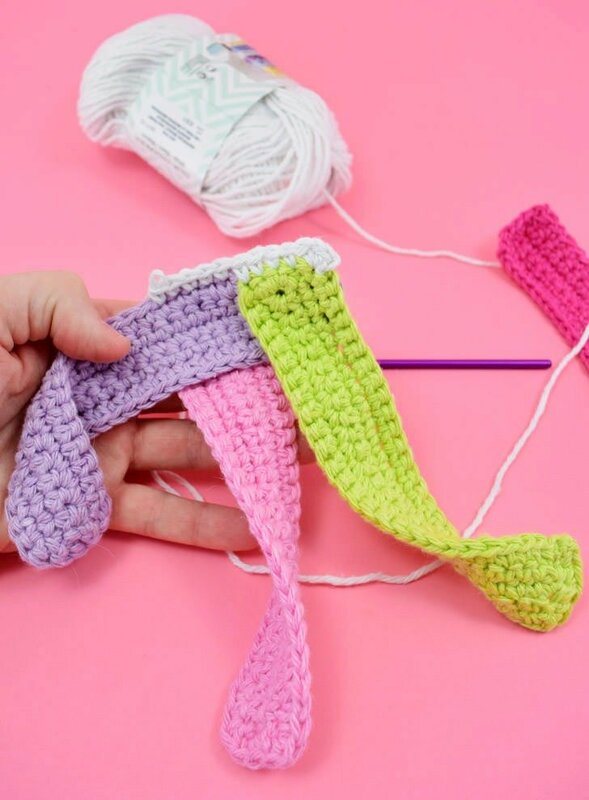 Be sure to go through both loops of the stitches from both strips for a nice, clean look. 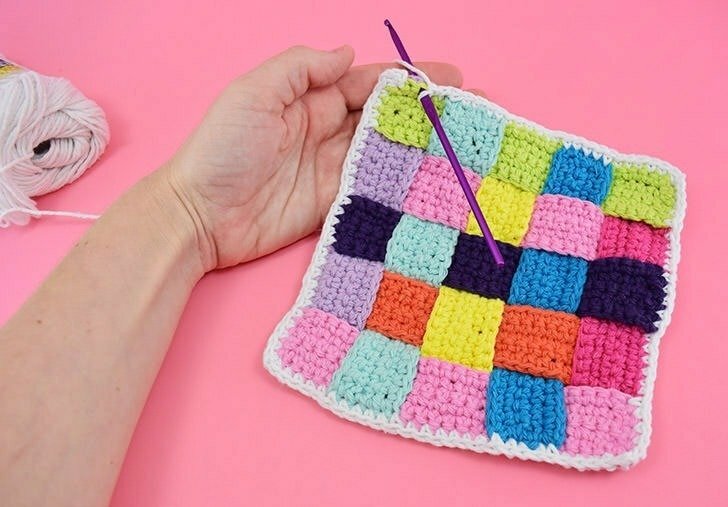 Single crochet to the opposite corner on your vertical piece. 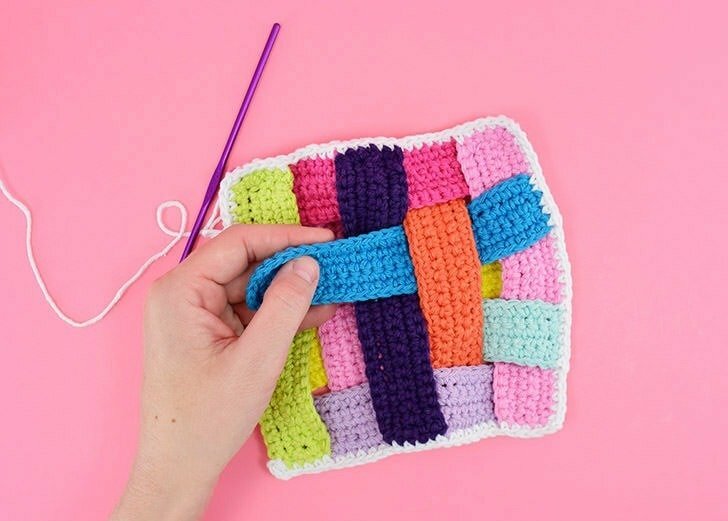 Once you’ve reached that end, for the corner with a single crochet in the last space (the corners where the two strips join), chain one and single crochet again in the same spot to form your second corner. 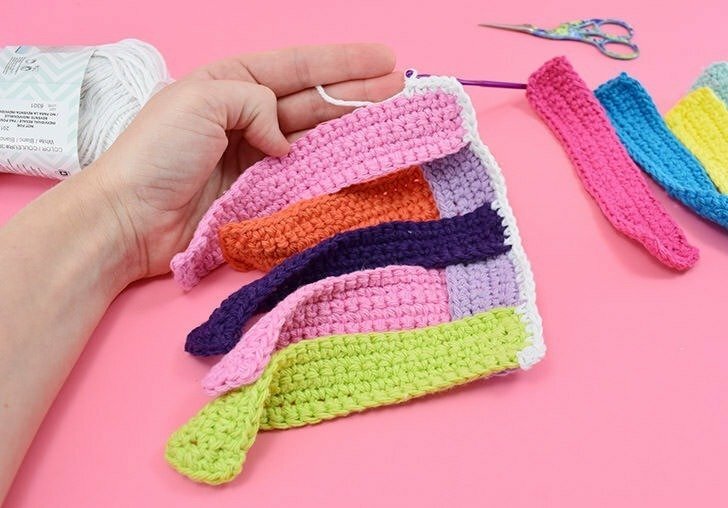 Continue on single crocheting to start your second side of the cloth, finishing attaching the 2 strips you’ve already got going together. Continue down this side attaching your strips changing your attachment from front to back of the horizontal strip until you reach the end, and then make your third corner as we have with the past two. For your third side, it isn’t important to worry about the actual weave being perfect. Even if you make it so, something is going to wriggle out of place. On this side just be sure that your strip mirrors the opposite side… that is to say if it’s attached UNDER the horizontal strip on the opposite side, it will also need to be UNDER the new horizontal strip you’re attaching to. Once you’ve finished that final corner and turned your work, that’s when you need to wrangle your strips and weave them in and out to make the pretty, woven texture. Don’t worry about getting them all perfect. Instead, work on weaving just the strip you’re about to attach. 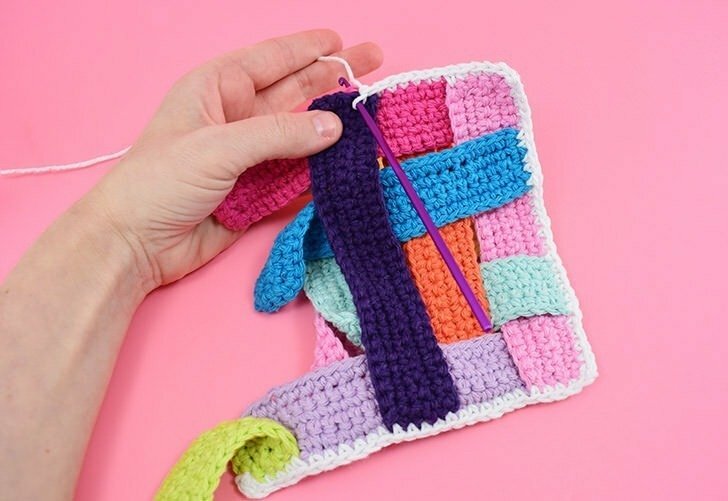 Continue attaching the pieces with your single crochet stitches, weaving the next strip and attaching it until you reach the end of this side. Once you’ve gotten all four sides done, double-check that your weave is right. Look good? 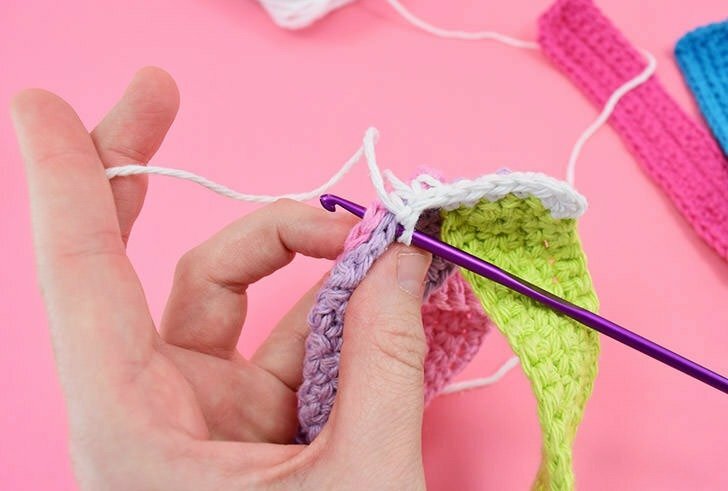 Slip stitch in your first single crochet of the border to finish it. 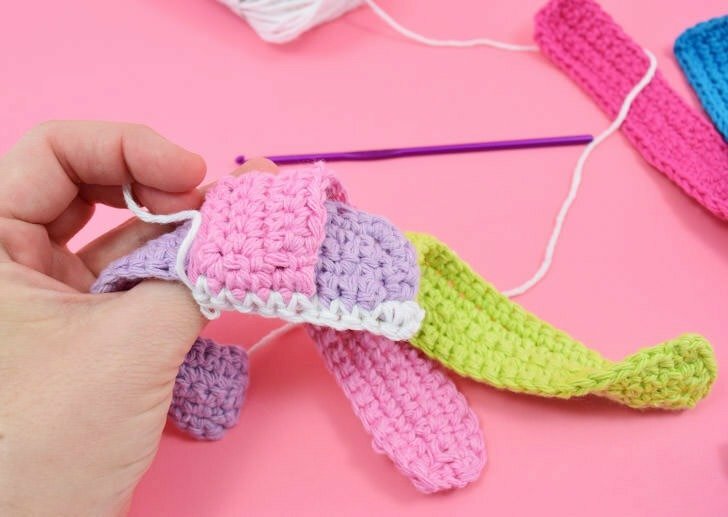 Chain once and then single crochet in every stitch to form a nice, thick border around the edge. Form corners as you did in the round before, single crocheting twice in the corner from the previous round with a chain in between them. 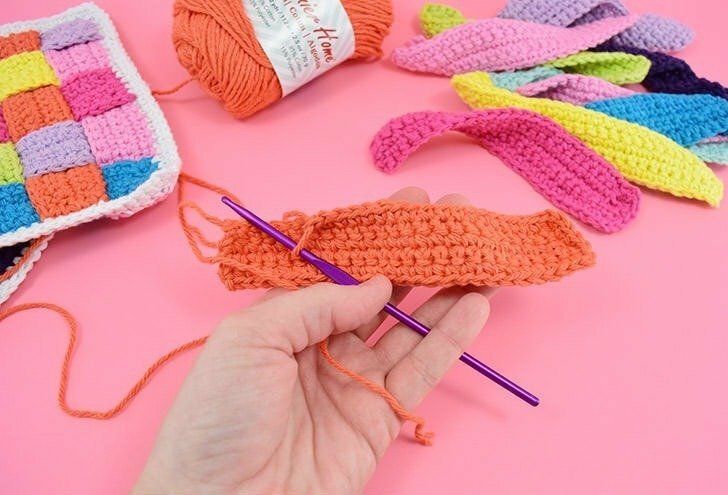 Once you’ve worked all of the way around, join your final single crochet to the first with a slip stitch. Weave in your ends. Isn’t that colorful and pretty? It’s also nice and thick because the woven texture of the fabric basically doubles up 2 layers of single crochet across the entire cloth. It gets a little heavier than a normal washcloth in the shower, but I feel like it suds up even better than a usual cloth, which I just love. I made my cloths with this cotton candy color themed 10-pack of cotton yarns by the brand Premier I picked up on sale at Michael’s. Using a half-price coupon it cost me only $10 for them all and I’ve used less than half of each color and made 3 cloths total, so you could make a TON of these if you’re working them up for gifts. And they work up pretty darn quickly, too. Plus, they’re just so pretty and unique. What do you think? I just want to thank you for this technique. I have been trying to find a way to make market bags that are different. I have decided to use this to make them. Right now I am just using a plain cotton yarn to test it. I have figured out how many to chain for the vertical strips and am working on the horizontal ones. Then I need to figure out how many of each I need.